Two years ago, she was designing and selling children’s clothes. Six months ago, he was managing restaurants. Today, Brian and Anissa Zajac make up House Seven Design + Build – an Indianapolis-based residential remodeling and design company. The couple recently finished filming a pilot for HGTV to consider as a new home remodeling design show. And this past September, we all met at their northside Indy residence to discuss their diverse backgrounds, how social media opened the door to entrepreneurship, and the challenges of working as life and business partners. Joe: Tell me about yourselves. Where do you come from? How’d you meet? Your family? Anissa: I’m from upstate New York. I grew up there and lived there until I was 18. Then I moved to Cincinnati for a short period of time before moving to Indy. I met Brian the first week I moved here. I actually applied for a job at Chumley’s in Broad Ripple because I wanted a part-time job. I was working as a manager at Banana Republic downtown, making $20,000 a year—really raking in the dough. Then I walked into Chumley’s. Brian: I was bartending. She filled out an application, and I took it to the owner. Joe: What brought you to the Midwest then, Anissa? Anissa: A boy. Yeah, I dated this guy in New York from 18 to 24. I was in college in New York. I thought I wanted to be a grade school teacher, which now I’m glad I didn’t do that. My college career came to a screeching halt when that boy I was dating moved to Cincinnati. I left with him, and my parents were super happy about that. And then when he moved to Indianapolis, I followed him a year later. We broke up six months after that. Joe: Where did you grow up, Brian? Brian: I grew up in Chesapeake, Virginia, right next to Virginia Beach. I was there until I was 12 or 13. We moved to Carmel where I graduated from high school, and then went to about every college in the state on and off for nine years. I’ve mostly worked in the food and beverage industry. I went from Chumley’s to Jack’s Pizza and ended up running six of those. Then went to Arby’s and ran 12-15 of those. Then moved out to Pennsylvania. That didn’t work out after a couple years, and we moved back here. Then I was a partner at Scotty’s Brewhouse for five years before leaving Scotty’s to run several Twin Peaks in Castleton. Joe: Growing up, were either of you raised around entrepreneurs? Anissa: I was not raised with any kind of entrepreneurship. I grew up as a Jehovah’s Witness. They don’t encourage an education because they think Armageddon is going to come tomorrow. You know, wait it out because the world is going to end. Going to college was not something my parents really cared about me doing. My dad worked in a mill. My mom was a stay-at-home mom. Joe: How about you, Brian? Did you have any entrepreneurs around you? Joe: I get that. Even two years after starting this business, my parents kept asking me, “How’s your job search going?” I’d respond, “I’ve got a job.” It wasn’t until I gave them a business card that they finally stopped asking. They didn’t understand how you could start your own business or not work for a corporation. Brian: Right, they had to work for one company typically all the way through their careers. Joe: Exactly. So what were your first introductions to entrepreneurship? Anissa: I always had some sort of creativity. I wanted to create something. I just couldn’t figure out what it was. So I started with making kids clothing for a few years. It filled that creative part of me for a bit. Joe: Let’s talk about House Seven. What’s the name mean? Anissa: It’s super original. We lived in our seventh home, and we were fixing it up. It was a brand new house that we tore apart and put back together the way we wanted it. Joe: Tell me how it got started. Anissa: When I had the kids clothing line, I started a blog. I was constantly posting about the clothes. Then when that eventually dissipated, I felt like I needed something. I was staying home with the kids, and I needed an outlet. So I decided to start blogging about my house. I always liked decorating. Even as a little kid, I was always decorating my own house. My mom would just let me do my thing, which, in retrospect, is kind of weird letting your 10-year-old get pillows and hang things on the wall in our main living space. I started documenting things on the House Seven blog. I posted like three times a week — trying to compete with all these other bloggers — but it became too time consuming. Then I discovered Instagram and started posted there instead. Joe: Yeah, I’d say 124,000 House Seven Design followers qualifies as a success. Brian: Yes, it started taking off, and then she needed “content” — meaning, I had to constantly do projects after I got home from work. Joe: Hey, we love content marketing. And so it didn’t begin with the intent of launching a new business. Anissa: No, it was purely to share and document work on the house for our own personal reference. I started doing that and then one person shared me, then another, and then it started to grow and grow and grow. Then people started sending me things — bowls, rugs, photographs, sofas — to include in my Instagram posts. We were inundated with stuff on a weekly basis. Brian: We had mattresses out the wazoo. So much cardboard. That’s all I remember: cardboard. Anissa: So many mattresses. Then I realized that not only could I trade items, but I could also start charging people for blog posts. I could start charging people for Instagram posts. I think I started charging like $50 for an Instagram post. Of course, now it’s gone up from that. But that’s even changed a lot since Facebook took over Instagram and all the algorithms changed. It hit everybody hard. Those were bad days. Brian: You just made the merger of Instagram and Facebook sound like The Great Depression. Anissa: It was frustrating. All the things you’ve been doing for all those years suddenly didn’t work anymore, and then Facebook determined who you want to see and when you want to see it. Brian thinks I’m nuts, but it drives me crazy. I mean you can go from having a 1,000 likes on something then all of a sudden it drops to 400 likes. My biggest thing was that that was how I made money. Sponsors look at the stats and think, “Okay, well people aren’t really interested in her anymore. I’m not going to send her anything. I’ll go to the next person that gets more.” So that’s all been a bit frustrating for me, but that’s how House Seven started. Joe: Were you working another job at that time? Anissa: I was staying at home with my kids and babysitting some neighborhood kids. When people started asking me to consult, the first response in my mind was, “I can’t do that. I don’t have a degree. What if somebody asks me something that I’m not qualified to address.” And so I didn’t for a little bit. But then my cousin passed away quickly from a brain tumor. He was diagnosed two weeks before December and dead by May. It was fast. And when that happened, it was the reminder that life’s too short. I wasn’t doing the things that I wanted to do because I was holding myself back. And so I started consulting. It started out slow. I charged like $75 for a styling consultation at somebody’s house. Brian: We were breaking the bank. Anissa: Right. But people started emailing and hiring me. 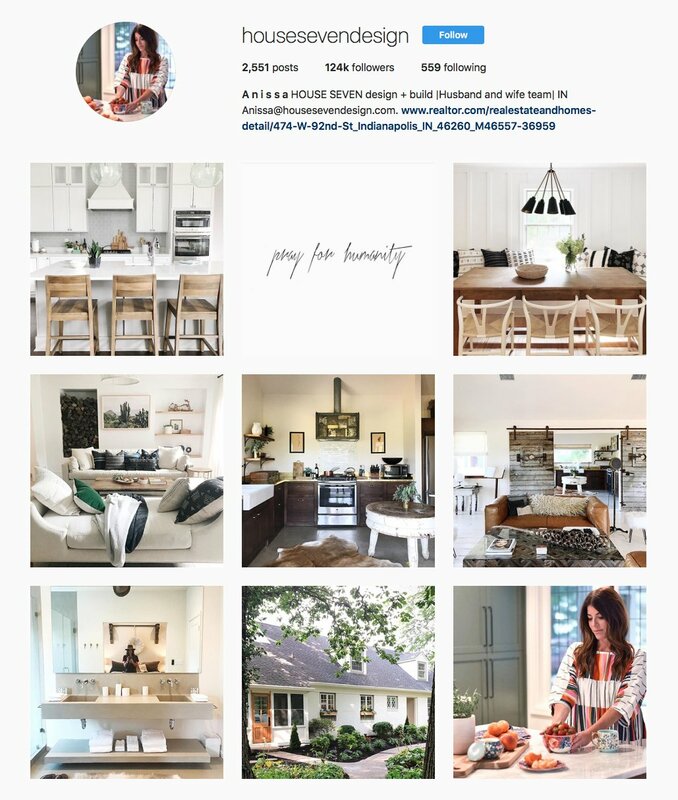 Joe: All through sharing your personal home projects on Instagram. And Brian, what path led you to leave the restaurant game? Brian: I had an epiphany moment about a year ago. The burning bush started talking to us. Brian: Yeah, I remember that the worship kind of freaked me out a little bit, but the message was unbelievable. And the next five or six messages, man, I had to fight back not to bawl. It hit you that much in your soul. Then after going there about a year, we started talking about what’s important, about simplifying our lives, and about getting back to . . .
Anissa: . . . what can we do to change our state? We weren’t happy. We weren’t unhappy, but it wasn’t an authentic life. You know what I mean? We were living in the suburbs, and we didn’t really love it up there. We were just up there because we felt like that’s where we were supposed to be. Joe: And this was about a year into turning House Seven into a business? Anissa: Mm-hmm (affirmative). Yeah, a year into it, but it was still pretty meh. Joe: Sounds like the first three years of running Keyhole Marketing. I kept thinking that if something else came along, then I’d just go back and work for “the man.” I wasn’t quite convinced I was still going to do this thing. And Brian, you were still working for Twin Peaks? Brian: That was the longest we’ve ever lived in one house. Anissa: Yeah, I just felt like it was a good time to sell our house then. We could make a lot of money, and then we could pay off all of our debt. Brian: Live so much more within our means. Anissa: We could move back down to Indy, where we’d been talking about wanting to be. Brian: Once I heard “back down where we want to be,” that’s when I said okay. Anissa: We ended up selling our house in six days, paid off all our debt, and moved into an apartment for three months over the summer. Joe: I’m still curious how you made the jump to House Seven Design full time, Brian? Anissa: I started doing bigger projects — like whole house remodels — and clients would ask if Brian could do trim work or build a barn door or whatever. I’d tell Brian, but he was working like 70 hours a week. These requests kept coming in, and we kept saying “no.” But then finally we felt like God was telling us to make the move. Brian: We were waiting for something. Looking for God to give us some kind of sign to quit my job. And after we had to turn down two sizeable projects because of my full-time job, we finally realized it was time to quit. Anissa: And so he quit his job, which was the second time he tried to quit this job. Brian: They told me “no” again. Anissa: They kept him on as a consultant, and he could come in whenever he wanted. He basically made sure that the restaurant wasn’t blowing up. Brian: It was a nice little safety net at the time because we didn’t know how busy we’d be. Brian: I just didn’t have the time. Anissa: I think that’s telling of his personality, though. When you try to quit your job twice in a year, and they tell you “no” both times. Joe: Tell me more about the pilot you filmed for HGTV. How did that come about? Anissa: While we were living in that apartment in Noblesville, I had this production company in Los Angeles message me on Instagram — coincidentally called House Eight Media — wanting to talk to me about potentially creating a show around Brian and me. Brian: We figured he tells everyone that. But then I looked him up afterwards and was shocked at some of the things he’d done. Anissa: He’d done Extreme Makeover: Home Edition, Celebrity Motor Homes, Million Dollar Rooms, and the Average Joe dating show. Joe: And were you still living in the apartment? Anissa: Yes, but while that was happening with House Eight Media, we’d found this house that we’re in now, which didn’t look anything like this when we bought it. Anissa: There were like five fraternity guys that lived here previous to us. I kind of hated this house at first. But it was in the neighborhood where we wanted to be, so we got it. And once we moved in, we started to remodel it. In the meantime, the producer, Nate, calls us and tells us that HGTV approved us and that he’d like to come out and film us for three days working on your house, showing off what we can do.” And so they did. Joe: Was there a certain angle they wanted to take at this point? Brian: Yeah, I mean we fight a lot, we’re very relatable. Anissa: No. So that happened in October, and we continued working on this house. Then in December, Nate called us again and said, “Brian is going to need to take some more time off work because we got approved for a pilot. We’re coming out next spring to shoot you guys!” But it couldn’t be filmed in our house. It had to be something different for HGTV to see. Brian: We had to get another house. Anissa: But we didn’t have the means to just go out and buy another house. We just bought this house less than a year ago. We went over the next night, had dinner, and he said, “Let’s buy a house. Let’s do it.” And we were like, “Seriously? !” And so we looked for a couple months and found a house. We then started shooting the pilot on June 19 and shot all summer long. Joe: How would you describe your working relationship? Brian: It’s give and take…up and down. Anissa: We’re still trying to figure it out. Brian: The one thing that has really stressed us more than anything is we have three children varying in ages, and there’s still everything at home that needs to be done. There are activities that need to be done. And we’re both trying to figure out when do we pull the plug on the day. Brian: Genuinely pull the plug and just put our phones down. Anissa: We find ourselves working until 11:00 p.m. The house gets messy. Then we’re not spending the time with the kids that they need. Brian: The struggle is real. Anissa: I also think our personalities are different and the way we work is different. I’m just very detail oriented, and I like things done a certain way. He is detail oriented, but not in the same way that I am. The stuff that’s important to him is not as important to me…and vice versa. We’re also learning how much to share with each other—work wise. We own the company together, but we work separately a lot. And so there’s no reason to tell each other everything that we are doing in our days—just the things that the other needs to address. So we’re trying to navigate what our roles are within the company. Joe: As you look down the road, what do you hope your kids glean from watching you guys own your own business, manage parenthood, etc.? Anissa: My biggest thing is I want the kids to know you can do anything you want to do. You just have to figure out how you’re going to do it. Neither of us have a degree, and we’ve been somewhat successful in where we’ve gotten thus far. We’ve never been afraid of working super, super hard. Brian: I want our kids to see a strong work ethic. I want them to know you can certainly be anything you want, but you have to apply yourself. You have to work. No one is going to hand it to you.